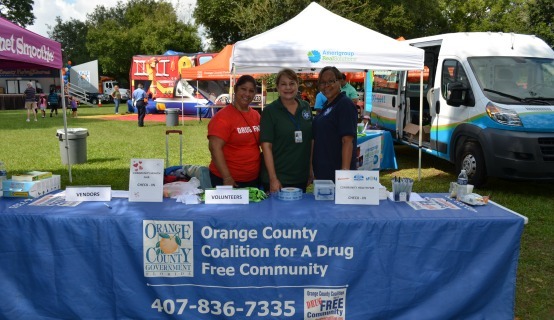 Orange County citizens were offered free health screenings and beneficial wellness and safety information at the second annual Community Health Fair held recently at Cypress Grove Park. Hosted by Orange County Mayor Teresa Jacobs, District 3 Commissioner Pete Clarke, the City of Belle Isle and City of Edgewood, the event offered citizens free health screenings, vision screenings CPR demonstrations, free vouchers for flu vaccines and a chance to meet Mrs. Florida America Courtney Shaw. More than 25 vendors attended the event including Orlando Health, Copely Eye Clinic, Orange County Fire Rescue, Teen Xpress, Orange County Sheriff’s Office, the University of Florida’s Cooperative Extension’s Mobile Gardening Unit, Amerigroup, the City of Edgewood Police Department and Orlando Health’s Pediatric Care Transport. The Orlando Health Pediatric Injury prevention staff was also in attendance offering free bicycle helmets and fittings for kids. Carol Burkett, director of Orange County’s Coalition for a Drug Free Community coordinated and planned the event. She said the Kids Zone, which included a bounce house, face painting and crafts at the event, was a big hit with area families. Along with all the fun activities, Orange County Professional Firefighters Local 2057 donated and prepared a wonderful lunch, with healthy snacks donated by Wawa and Florida Hospital. “While this event was designed for the entire family, we focused the activities and information with children in mind, like Orange County’s Wrap Around Orange program, which had a children’s craft table,” Burkett said. Walgreens also donated free flu shot vouchers and there were experts available to speak about healthy eating, prevention of diabetes, heart disease and other health tips. Orlando resident Marinelly Andujar said it was the perfect day to spend outside with her children. A collection of photos from the Community Health Fair are available on Facebook for use by the media.